The Harmony Hawks perform under the direction of John Hayden at the 2013 Spring Show at Prairie High Concert Hall . 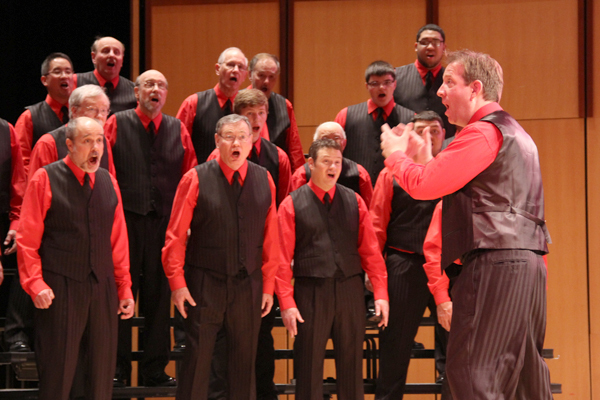 The Harmony Hawks Barbershop Chorus is a community service chorus based in Cedar Rapids, Iowa. Men and boys aged 16 and older from across Eastern Iowa sing with us. We are affiliated with the Barbershop Harmony Society, and barbershop harmony lies at the heart of our repertoire that also includes patriotic, gospel, and popular music arranged as four-part a capella harmony. Our mission: to promote singing for a lifetime. Our current members range in age from high school youth to senior citizens with over 60 years of singing experience in our chorus. By learning to blend our voices, we develop both our vocal skill and the bonds of friendship with each other. Singing invigorates us and keeps our minds sharp. Our mission includes reaching out to schools to assist them in bringing the gift of singing to their students. The Harmony Hawks Chorus and quartets compete yearly in the Central States District of the Barbershop Harmony Society. Preparing for contest sharpens our skills and raises the level of performance on all our songs. Under John Hayden’s direction, the Harmony Hawks have won the Plateau AA Championship in the five-state Central States Region. He is an active clinician at choral festivals in the United States and Canada, an arranger, festival judge, and has been on the faculty of Harmony University. John also has extensive quartet experience including singing lead with the current CSD Champion Quartet, Switchback. John teaches vocal music at Benton Community in Van Horne, Iowa.